Now I am as ready as I get for this part of the ARRL. Measured some sun noise and I measured approximately 13dB. Seems like I lack 2 dB or so but as I use coaxial cables and I have not tested the preamp as the Nf meter broke down so I it could be ok as is. I still think I have something generating some noise in my house as well because when I beam into it, the noise increases almost the same amount as the sun. Will try to find that later tonight before the moon gets up. I could not get Map65 to work with HPSDR so I use a FCD on 28MHz to avoid any overload. Thought about using a SDRPlay but the I need HDSDR to run in parallel and I don´t want that. It´s enough with HPSDR, WSJT, Map65 PST rotator and a web browser. I also like to have a picture editing sw running to save screenshots of the QSO´s. Will setup an additional screen later too. The output power from the amp at transverter almost at max is 750W and that’s ok for now. Needed to adjust the output indicator and when the fan kicks in and did run the amp without the case and there where massive feedback all over the place but non what so ever noted with the case on. 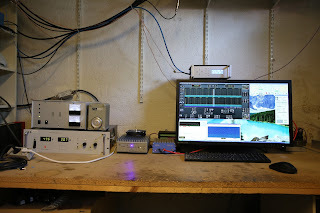 Have everything setup in the basement as I want to be as close the cables as possible but everything is possible to operate remotely so later on the rig and the amp will be seated here and I will operate from the shack upstairs. Right now I want to stay close to the gear in order to learn how everything behaves when operating for a while.